According to the Guinness Book of World Records, the most successful defense attorney in history was a man named Sir Lionel Luckhoo (1914-1997), who succeeded in getting 245 consecutive murder acquittals in his legal career. Nobody has ever come close to that. This man, who was knighted twice by Queen Elizabeth, took his expertise in law and went through the question of whether the resurrection of Jesus Christ would stand up to the rigors of legal evidence. This is what he concluded: "I say unequivocally that the evidence for the resurrection of Jesus Christ is so overwhelming that it compels acceptance by proof which leaves absolutely no room for doubt." Sir Lionel Luckhoo echoes the voice of the apostle Paul who said, “God is now declaring to men that all people everywhere should repent, because He has fixed a day in which He will judge the world in righteousness through a Man whom He has appointed, having furnished proof to all men by raising Him from the dead” (Acts 17:30b-31). If the evidence is true, then His claims that He is the Savior and Lord of all are true and His promise of forgiveness of sins and the gift of eternal life are guaranteed. Please consider the examination of the evidences (under resources) and then read “Your Next Move” to discover how you can experience the great reality and satisfaction Jesus Christ can bring to your life. God made the first move | He created everything, including Adam and Eve and made us all in “His image” to know Him and love Him as a reflection of His glory. (Gen. 1:1; Gen.1:27). Man made the second move | Though we were made by God and for God, Adam and Eve and all their offspring (including you and me) defaced God’s image by sinning against Him (Romans 3:23). Since God is perfectly righteous and just, He had to punish our sin because “the wages of sin is death” (Romans 6:23a). This death not only included eventual physical death, but also spiritual and eternal death (hell). Sadly, we are powerless to change this predicament by any good deed or religious effort (Romans 8:8; Ephesians 2:8-9; 1 Corinthians 2:14). Christ made the third move | God demonstrated His amazing love and mercy by sending His one and only Son, Jesus Christ. His sinless life and sacrificial death on the cross paid our sin debt in full (Romans 5:8, 2 Corinthians 5:15). His bodily resurrection from the dead validated all that Jesus said and did (Acts 17:30-31). Now it’s your move | God did for us what we could never do for ourselves by providing the complete solution to our sin problem. He provides the gift of eternal life and forgiveness of sin for anyone who wants to receive it. Two words sum it up: TURN and TRUST. Why Jesus versus any other religion? 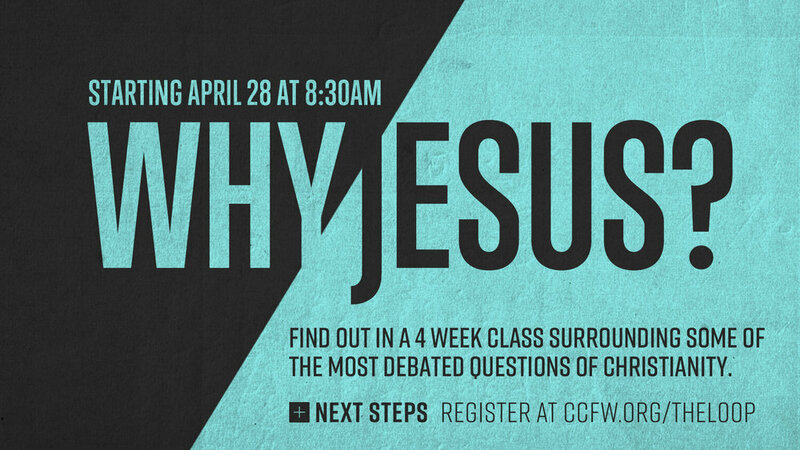 Find out in a multi-week class surrounding some of the most debated questions of Christianity.